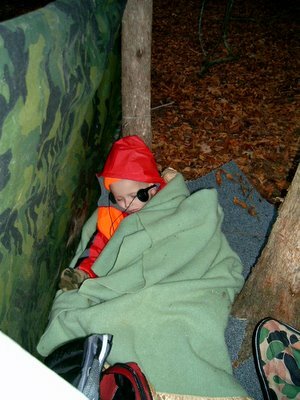 I decided to take Aaron Job, my five year old son, on his first deer hunt this year. My only concern was keeping him quiet and still long enough to have even the slightest possibility of having a deer come up on us. So, my ingenious wife packed his portable cd player & some cd's (audio books) for him to listen to in the deer stand. It worked! Well, it worked as far as keeping him still and quiet Saturday morning. After about 30 minutes or so, he was out! We got up around 4:45am & were in our stand by 5:30am. Our "stand" (see photo above) was nothing more than a camo tarp wrapped around some posts & a stool to sit on. I laid out some old carpet the night before, anticipating a need for Aaron Job to have something to sleep on. Even after he woke up from his nap, he sat on my lap very quiet and still for another half hour or so. We returned to camp by 8:15am which, was pretty good considering the circumstances. However, no deer. Saturday evening's hunt was a bit different. 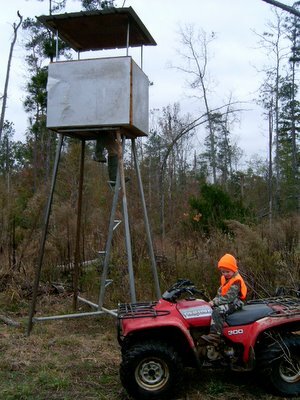 We went to a different stand (above photo) - a box stand perched on 15' legs. I saw three deer on this stand one evening last year, so I had high hopes. Just as the sun went down and it began to get dark, I was telling Aaron Job to be looking close, because he wouldn't be able to hear the deer, they could just quietly slip out of the underbrush at any time. As I was whispering this to him, he calmly said (as if he wasn't suprised), "There he is." I looked, and sure enough here comes a buck walking right toward us. After at least 10 minutes of trying to count horns (3 points on one side is the minimum requirement), Aaron Job all the while squatting down with his fingers in his ears (he actually stood up twice to look at the deer, which, suprisingly, didn't run off! ), I aimed, I shot, I made contact. So, long story short... we spent 15-20 minutes following his blood trail, and my brother-in-law finally found him about 30 yards away. Great day! 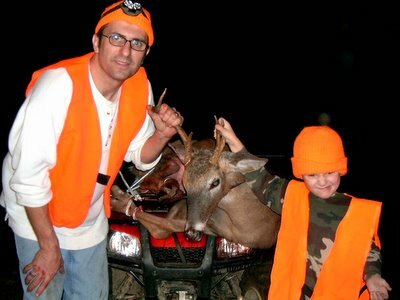 Aaron Job's first day of hunting, Aaron Job's first deer. My umpteenth day of hunting...my first deer. I'm not sure who was more excited! Way to go Aaron...sure looks like y'all had fun. That second one sure looked better than the first "stand." Maybe that had something to do with the kill?? Anyways, congratulations...I'm sure Aaron Job will remember that for a long time. sweet. one of my first memories is of a deer hanging up in our garage.